Throughout history women and men have had the urge to decorate and adorn themselves. Some cultures use simple tools and natural found materials, others have developed sophisticated gem-cutting and metal-working technologies and high-level making skills, enabling complex pieces to be produced. Regardless of technical competence, the reasons for this deep-rooted custom are essentially the same. 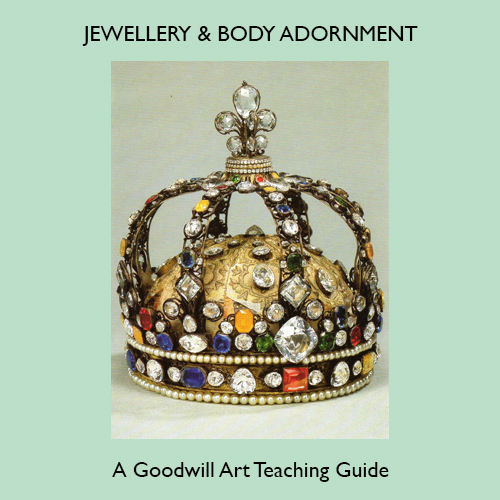 Going beyond the impulse to decorate, wearing jewellery and body ornaments can reflect the pursuit of wealth, power, religion, or love, the confirmation or denial of self, the flattering of vanity and easing of superstitious fears. Archaeologists, ethnologists, anthropologists and art, craft and design historians have all contributed to the analysis of these complex and overlapping functions. The 25 images and 39 pages in this e-book offer concise information, teaching ideas and the opportunity for fresh and creative thinking about the subject.